“Little Beavers” officers at the Dining Out, 24 April 2003. Remarks by VADM Ray Peet, USN (Ret.) from the DesRon 23 Dining Out, 24 April 2003. VADM Peet’s complete oral history is available from the US Naval Institute. To say that I’m glad to be here this evening to celebrate the “history of the Little Beaver Squadron” would be a gross understatement. However, I know that, given the fact that I was a “Little Beaver” over 60 years ago, you are probably thinking that at my age I should be happy to be anywhere. 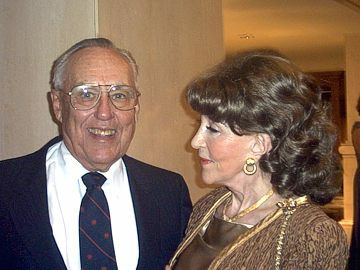 Vice Admiral Ray Peet and Dian Peet at the DesRon 23 Dining Out, 23 April 2004. Commodore Van Hook and Jeff Scudder asked me to tell you tonight firsthand sea stories relating to the early history of DesRon 23. Since they gave me no time limit, I’m not sure they knew what they were subjecting you to. You could be here all night; however, rest easy for at my age you also need to be in bed early. Needless to say I’m proud of having been in your shoes—serving our wonderful country, in our fine Navy and in a gallant DD squadron. I served in World War II after Pearl Harbor. You are serving today following 9/11. Our experiences may be different but the objective is similar—win the war. Following graduation with the Class of ’43 from the US Naval Academy, a year early, in June 1942, I was retained as an instructor to train new plebes entering the Academy that summer. For that penance I was promised duty of my choice at the end of the summer. I chose a new construction destroyer following attendance at a Fire Control School in Washington, D.C. This led to my being ordered to the USS Converse, a [2,100-ton] DD building in Bath, Maine. I reported for duty in November 1942. The skipper, Captain Dewitt Clinton Hamberger, was a very experienced destroyer man. He did a fantastic job putting a commissioning crew together. His Executive Officer, Chief Engineer, and I were the only Regular Naval Officers, all the others were Reservists. I was to be Assistant Gunnery Officer, Assistant First Lieutenant, and Assistant Damage Control Officer. In short I was “George.” I had a lot to learn as did most of the crew. Upon departure of the ship from Bath in December we conducted sea trials off Casco Bay in the North Atlantic. The weather conditions were awful. I was cold, seasick and miserable. Would you believe we chained our chairs to the wardroom table and wet the tablecloths to keep our plates within reach? I thought then, surely this isn’t going to be my life’s work. Becoming a math professor at the end of the war came to mind. Following sea trials we proceeded to Boston for commissioning ceremonies, then on to Guantánamo for fleet training. From there we passed thru the Panama Canal and on to San Diego for gunnery training off San Clemente Island. I didn’t even go ashore in San Diego. The only tall building in town then was the EI Cortez Hotel. Besides I was too busy learning my jobs. I don’t need to tell this audience how motivated you can be when you know your ship is heading in harms way. Following an extensive gunnery training program we sailed in company with the Pringle to the South Pacific to join DesRon 23 at Espiritu Santo in the New Hebrides Islands. Enroute we conducted live offset firings at each other, etc. We had a brief stopover in Pearl to take on supplies. My memory of this visit brings to mind two rather insignificant events. At that time in Hawaii liquor was being rationed. At our cook’s request I traded my ration to a shipyard worker for a stainless steel pie rack. You see, our rough weather experience in the North Atlantic taught us to secure items near and dear to our hearts and stomachs. (Also, in those days, I was a teetotaler.) We also received on board additional crew members in Pearl. To our dismay they were a group of brig personnel released to perform hazardous duty in lieu additional brig time ashore. You can imagine the psychological impact this had on our crew. However, it worked out well. Self-preservation is infectious. I don’t remember any problems that resulted from this augmentation to our excellent crew. A few days later we spotted a life raft in the water with several people on board. Pringle approached the raft with rescue in mind. As they got near, a Japanese officer stood up in the raft, harangued the curious Pringle crew peering at them over the rails, pulled out a gun, proceeded to execute everybody on the raft, and then, put the gun in his mouth and blew his head off. It’s hard to forget such a horrific scene but it did educate us regarding the dedication of the enemy we were soon to engage. Upon our arrival in the South Pacific theater we hooked up with Commodore Burke and the rest of our squadron. The Commodore presented to us his now famous Squadron doctrine. I won’t go into great detail of the formation of the “Little Beavers” and their exploits. That is well reported in Ken Jones’ book “DESRON 23,” which I’m sure you’ve all read. If you haven’t, you should. “George” is even mentioned in this book. I’m described as “a sort of little bantam rooster, quiet of demeanor, short of stature and dark almost to the point of swarthiness.” I guess that is something of which I should be proud? Also mentioned is that I was the OOD during the Battles of Empress Augusta Bay and Cape St. George. How did it happen that an ensign would be entrusted with the conn under existing circumstances—steaming in close formation (500 yards), at high speeds (30+ knots), on moonless nights, and in battle? Not once during these battles was I relieved of the conn. There had to be a reason for an ensign being put in that position; and it was a simple one. Our skipper wanted to put together the best fighting team he could. It so happened that during our training programs it was obvious that I could see better at night than anyone on board and had quick reaction time. I was able detect changes in the wake of the ship ahead and adjust station accordingly, thus minimizing our chances of a collision. As a consequence, Capt. Hamburger had me sleep on a life jacket next to the helm during Condition 1-E with orders to take the conn at the sound of GQ. He, of course, was always nearby but free to study the tactical situation, listen intently to bridge radio transmissions, monitor the surface radar scope and give me orders. Not a bad setup, even a wise one on his part, given we, unlike others in the squadron, came thru these engagements unscathed. In the South Pacific, DesRon 23 was based in Purvis Bay across the waters from Guadalcanal. From there we made runs up the “Slot,” a logistics route the Japanese used to replenish their Guadalcanal garrison. We searched nightly for enemy activity. On these runs we encountered barges along the shore line, PT Boats, and snooper planes. We sank numerous barges, knocked down a few aircraft—the most notable one, to me, crashed close by our fo'c'sle and spilled avgas on us. Inasmuch as I was responsible for the cleanliness of the fo’c’sle area, this was particularly upsetting to me. Once the Slot was under control, the squadron was given shore bombardment assignments in the Bougainville area which we accomplished in daylight. Enroute to a bombardment, Converse encountered a surfaced, enemy submarine. I was ordered to head for the contact with ramming in mind. When we were about 5000 yards away Commodore Austin felt we’d be discovered before we could ram the contact and he ordered our 5-inch battery to open fire. Shortly thereafter the contact disappeared from the surface and we proceeded to our rendezvous point. Following the war I learned we did, indeed, sink a Japanese sub that night. Now for shore bombardment episodes: if you want a thrilling experience at sea, undertake shelling shore batteries in broad daylight, experiencing huge counter battery splashes on both sides of your ship, fishtailing at high speed in formation, and emitting a smoke screen as you depart the scene. We did that twice—once off Buka Island and another near Rabaul. Luckily we suffered no damage to any of our ships. Naval intelligence provided to us during this period was outstanding. The US had broken the Japanese code. This led to the Air Force, being able to shoot down Adm. Yamamoto enroute to inspect his forces on Bougainville. It also led to the famous Battles of Empress Augusta Bay and Cape St. George. At Empress Augusta Bay, Task Force 39, consisted of four 6-inch cruisers with Desron 23 escorting. The Force was under the command of Radm. Tip Merrill. Our mission was to support a landing of US ground forces on Bougainville. The battle is described in detail in Ken Jones’ book. Frankly, I didn’t comprehend what was going on at that time. Nor did I, until I read Jones’ book after the war. All I remember of that night was pure bedlam and mass confusion. I was so busy keeping station, trying to follow commands emanating from loud and noisy bridge speakers, witnessing enemy starshell firing, and hearing our own cruiser 6-inch shells pass overhead. I do remember, vividly, we were the third ship in column, the division commodore having shifted to the Spence for this engagement; and that, the ships I was following, Spence and Thatcher, collided but suffered relatively minor damage. The ship astern, the Foote, took a torpedo in her fantail as she was trying to catch up to us. She went dead in the water and out of action for the rest of the war in the South Pacific. All in all, for me the Battle of Empress Augusta Bay was a nightmare. Following this engagement I was, to put it mildly, pooped. I think I even slept thru a few air attacks enroute to home base. 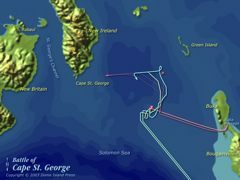 Battle of Cape St, George. Now for the piece de resistance—“The Battle of Cape St. George.” Intelligence told us a force comparable to DesRon 23 was going to evacuate Japanese personnel from Bougainville. What an opportunity for the “Little Beavers!” Adm. Burke was beside himself with joy. And the feeling quickly spread throughout the squadron. Everybody was eager to test the battle plan. Events to follow proceeded with precision. We all understood what was happening and knew the role we were to play. We encountered the enemy forces on schedule in the middle of a very black night. As planned DesDiv 45 opened fire with torpedoes and our division blasted the enemy with gunfire as DesDiv 45 pulled clear. Converse, much to the chagrin of Commodore Austin, who was back on board for this fracas, was assigned the task of finishing off a burning hulk while Adm. Burke chased the few remaining ships afloat to Rabaul. After finishing off our cripple we proceeded to join DesDiv 45. The chase for all of us proved futile. As daylight approached we found ourselves close to New Guinea and well within range of Japanese air bases. Wisely, Adm. Burke ordered his tired but happy, ships to retreat to Purvis Bay. The incident that stands out in my mind in all of this took place as Converse was covering DesDiv 45’s torpedo run. We were hit by a dud torpedo amidships. I was on the wing of the bridge at the time. The impact of the torpedo knocked me off my feet. We lost power momentarily and proceeded on our way undeterred. The engineers performed admirably. We didn’t know then exactly what had happened, nor did we know, until our return to port and were able to put divers over the side. They verified the outline of a torpedo body impressed in the port side of our hull, amidships. The return to Purvis Bay following the battle was uneventful—the expected air attack didn’t occur. We arrived in port late at night prepared to refuel and replenish ammo in accordance with Commodore B’s squadron doctrine—“be ready at all times for battle.” To our complete surprise, awaiting us in the harbor was the rest of Task Force 39. All ships were lighted, with all hands manning the rails, and they saluted each ship in our squadron as we passed by to our anchorages. This incident still chokes me up upon recall. Good news awaited Converse. Given uncertainty regarding any underbody damage caused by the torpedo hit, Converse was ordered to proceed to Sydney Australia for dry-docking and hull inspection. You can imagine the jubilation on board, after experiencing nearly 9 months of continuous sea duty in the South Pacific. Upon our arrival in Sydney, one of the most beautiful harbors in the world, our crew was beside themselves—particularly when they were greeted by fair Australian damsels whose boyfriends were all away fighting in New Guinea. However, the most amazing fact is that when we sailed to rejoin DesRon 23 we didn’t have a single AOL. In due course, Converse and Spence were ordered to return to the States. We set sail for Mare Island and a shipyard overhaul. Prior to our departure from the war zone Capt. Hamberger was relieved by Capt. J.B. Colwell. The trip home was uneventful. I do remember the ship yard period vividly, for many reasons. Capt. Colwell had an emergency in his family and he took leave, leaving me—two years out of the Naval Academy—in charge of the overhaul for a couple of weeks. In two years I’d gone from “George” to Gun Boss, Ensign to Lieutenant, and now Acting Exec. During the overhaul period I worked closely with the skipper of the Spence and we became good friends. Following our overhaul in San Francisco, Converse again sailed for duty in the far Pacific. Upon arrival in Pearl I received orders to a new construction DD as Gunnery Officer. I wasn’t particularly thrilled about those orders. You see a little bit of success had gone to my head. Simultaneously the skipper of the Spence needed a new Executive Officer and when he learned of my orders, he wanted my orders changed to report as his Exec. I, of course, was delighted at the prospects; however, we couldn’t effect the change prior to the time I was to be detached and the ships were to sail. It was agreed that I’d proceed to Washington, D.C. and ask that my orders be changed. Upon my arrival in D.C., I told the detail officer in BuPers about wanting to go to the Spence; he looked at me incredulously and informed me that Spence had capsized in a storm 2 weeks after my departure from Pearl with only 24 survivors. Again luck and fate were with me. My orders were changed; however, before I could report to new construction. Aulick, an original DesRon 23 ship that never joined us, had been hit by a kamikaze pilot, and was undergoing overhaul at Mare Island. She needed a battle tested Gunnery Officer urgently. Needless to say I was very disappointed with this new assignment. In my mind new construction would have been better than taking over someone else’s headache. Again luck was with me. These orders really changed my whole life for the better. Why? My roommate in Aulick arranged a blind date for me in San Francisco with a very beautiful United Airline stewardess fresh out of college. At the end of the evening on my way back to the ship I told my roommate, “I’m going to marry that girl.” How’s that for cockiness? Well, six months later I did. My lovely Dian is here with me tonight, 60 years later. The Navy should award her the Croix de Guerre for service above and beyond. Aulick went thru a rigorous training program prior to deploying again. By now I was overly trained. My primary job was to help restore the morale of a badly shaken crew. Again my eyesight served me well. To the delight of a very uptight crew, I was able to show them I could spot 5" projectiles quite precisely. As a team we knocked down target sleeves regularly during our training period. We all gained confidence in ourselves. Upon our arrival off Okinawa we were assigned to an antiaircraft patrol station. Two incidents on Aulick stick in my mind. One occurred during a kamikaze attack. We were shooting at him frantically and saw him crash alongside the DD next to us in formation. The plane exploded underneath that ship blowing out her underbody. The ship sank within minutes. Miraculously we were able to pick up every member on board. The other incident also occurred during an air attack off Okinawa. Upon the sounding of General Quarters, my director crew pushed me up the ladder to the director so fast I banged my head against a hatch and chipped a front tooth. Later I was sent to a tender anchored nearby to suffer a root canal operation during another air attack with the tender covered by a smoke screen. This ended my memorable DesRon 23 experiences. Within five months of reporting on board Aulick, I again received detachment orders—this time to Post Graduate School in Annapolis to be followed by two years of graduate study at M.I.T. Enroute to Annapolis, true to my promise, I stopped off in Union, Oregon and married my lovely bride at her home on the Oregon Trail, which was settled by her ancestors many years ago. Now you know more about this “Little Beaver” than you probably ever wanted to know. Thanks for inviting me to be with you tonight. I wish you all smooth sailing, following seas and lots of good luck. Commodore Van Hook said you might have some questions.